Joseph E. Stiglitz was born in Gary, Indiana in 1943. A graduate of Amherst College, he received his PhD from MIT in 1967, became a full professor at Yale in 1970, and in 1979 was awarded the John Bates Clark Award, given biennially by the American Economic Association to the economist under 40 who has made the most significant contribution to the field. He has taught at Princeton, Stanford, MIT and was the Drummond Professor and a fellow of All Souls College, Oxford. He is now University Professor at Columbia University in New York, where he is also the founder and Co-President of the university's Initiative for Policy Dialogue. He is also the Chief Economist of the Roosevelt Institute. In 2001, he was awarded the Nobel Prize in economics for his analyses of markets with asymmetric information, and he was a lead author of the 1995 Report of the Intergovernmental Panel on Climate Change, which shared the 2007 Nobel Peace Prize. In 2011, Time named Stiglitz one of the 100 most influential people in the world. Stiglitz helped create a new branch of economics, "The Economics of Information," exploring the consequences of information asymmetries and pioneering such pivotal concepts as adverse selection and moral hazard, which have now become standard tools not only of theorists, but also of policy analysts. He has made major contributions to macroeconomics and monetary theory, to development economics and trade theory, to public and corporate finance, to the theories of industrial organization and rural organization, and to the theories of welfare economics and of income and wealth distribution. In the 1980s, he helped revive interest in the economics of R&D. In the last fifteen years, he has written a series of highly popular books that have had an enormous influence in shaping global debates. His book Globalization and Its Discontents (2002) has been translated into 35 languages, besides at least two pirated editions, and in the non-pirated editions have sold more than one million copies worldwide. In that book he laid bare the way globalization had been managed, especially by the international financial institutions. In two later sequels, he presented alternatives: Fair Trade for All (2005, with Andrew Charlton) and Making Globalization Work (2006). In The Roaring Nineties (2003), he explained how financial market deregulation and other actions of the 1990s were sowing the seeds of the next crisis. Concurrently, Towards a New Paradigm in Monetary Economics (2003, with Bruce Greenwald) explained the fallacies of current monetary policies, identified the risk of excessive financial interdependence, and highlighted the central role of credit availability. Freefall: America, Free Markets, and the Sinking of the World Economy (2010) traced in more detail the origins of the Great Recession, outlined a set of policies that would lead to robust recovery, and correctly predicted that if these policies were not pursued, it was likely that we would enter an extended period of malaise. The Three Trillion Dollar War: The True Cost of the Iraq Conflict (2008, with Linda Bilmes of Harvard University), helped reshape the debate on those wars by highlighting the enormous costs of those conflicts. His most recent books are The Price of Inequality: How Today's Divided Society Endangers Our Future, published by W.W. Norton and Penguin/ Allen Lane in 2012; Creating a Learning Society: A New Approach to Growth, Development, and Social Progress, with Bruce Greenwald, published by Columbia University Press in 2014; The Great Divide: Unequal Societies and What We Can Do About Them published by W.W. Norton and Penguin/ Allen Lane in 2015; Rewriting the Rules of the American Economy: An Agenda for Growth and Shared Prosperity published by W.W. Norton in 2015, The Euro: How a Common Currency Threatens the Future of Europe published by W.W. Norton and Penguin/Allen Lane in 2016 and Globalization and Its Discontents Revisited: Anti-Globalization in the Era of Trump published by W.W. Norton and Penguin/Allen Lane in 2017. 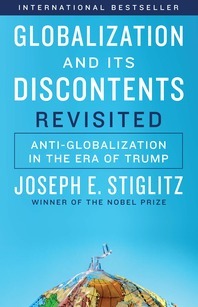 Stiglitz's work has been widely recognized. Among his awards are more than 40 honorary doctorates, including from Cambridge and Oxford Universities. In 2010 he was awarded the prestigious Loeb Prize for this contributions to journalism. Among the prizes awarded to his books have been the European Literary Prize, the Bruno Kreisky Prize for Political Books and the Robert F. Kennedy Book Award. He is a fellow of the National Academy of Sciences, the American Academy of Arts and Sciences, the American Philosophical Society, and the Econometric Society, and a corresponding fellow of the Royal Society and the British Academy.